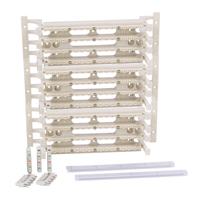 Simplified ordering of a complete Category 6 or 5e, EIA 19” rack mount 110 cross connect field is facilitated by the use of Hubbell’s rack mount 110 Field Termination Kits. 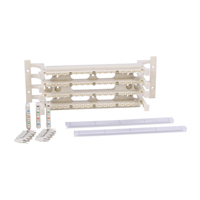 6-110 and 110 Rack Mount Kits provide a reliable, cost-effective, front terminated solution to manage communications equipment wiring in the telecommunications room when front termination is desired over the modularity of a patch panel. Rear cable access holes and increased channel width on wiring blocks allows jacketed cable to be routed from behind the wiring block close to termination helping to maintain proper pair twist. 6-110 components exceed TIA/EIA-568-B.2-1 Category 6 component specifications to accommodate today’s high-performance cabling needs. 110 field termination kits are tested and verified to meet and exceed Category 5e ANSI/TIA/EIA-568-B.2 connecting hardware specifications to support both high-speed data and voice applications. - Unique third hand locating pins hold panel in place on rack while installing screws. - Optional rear cable organizer (HC36WF) clips to the rear of the panel. 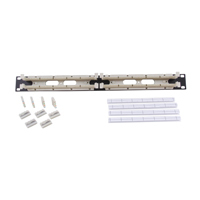 - Rolled edge construction provides superior strength during termination. 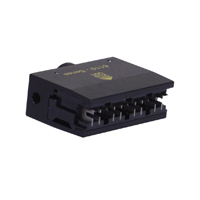 - Increased Pair Isolation on 6-110 wiring and connecting blocks provides for superior NEXT performance. - Compatible with Hubbell Labeling Software and laser-printable 110 paper label sheets. Hubbell brings connectivity to the next generation of performance with our NEXTSPEED® 6-110 Cross Connect System. A high-performance wiring block system that completes our NEXTSPEED® Category 6 and NEXTSPEED® Ascent 10GbE Channel Solution by managing communications equipment wiring in the telecommunications room and main distribution frames or as a consolidation point. Designed to support Category 6 and 10GbE cabling applications, Hubbell’s NS6-110 cross connect provides a reliable, cost-effective, front terminated solution using a minimum amount of space. 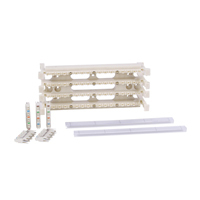 Field termination kits facilitate easy ordering and include everything needed to assemble and configure a complete 6-110 Category 6 cross connect field. 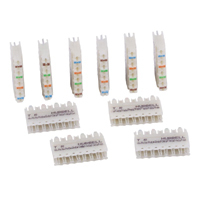 Field Termination kits are available with 64- or 192-pair wiring blocks and appropriate number of 4-pair connect- ing blocks and port identification labeling. 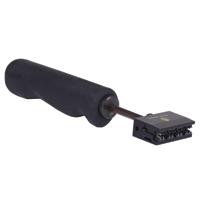 This termination tool is designed to seat 6-110/4-pair connecting blocks and terminate/cut UTP cable on 6-110 wiring blocks. Hubbell Category 6, 4-pair connecting blocks are terminated to the wiring blocks utilizing a Hubbell 6-110/4-pair impact tool. Each connecting block features high definition color coding, tip and ring markings, and angled IDC towers to make conductor placement and lacing easy. - Cable access holes and increased channel width allows jacketed cable to be close to termination helping to maintain proper twist. 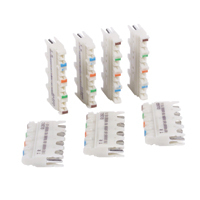 - Cat 6 field terminated patch plugs allow custom length patch cords to be assembled in the field by utilizing a labor savings snap fit design. 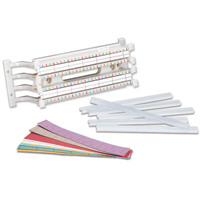 - High-definition color coding tip and ring identification make placement easy. 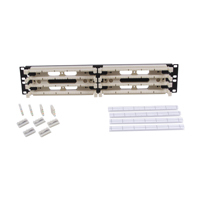 - Versatile solution consisting of 64- and 192- wiring blocks, 4-pair connecting blocks, field termination kits. Hubbell’s 110 connecting blocks are terminated to wiring blocks using a 5-pair impact tool. They utilize Insulation Displacement Contacts (IDC) and are available in 3-, 4-, and 5-pair sizes. The are sold in packages of 10. The Siemon S110/S210 cable managers are the foundation of a series of cable management products that are designed to support S110 or S2100 cross-connects and patch panel applications. They can be order individually for field assembly in wall-mount applications. The cable managers are manufactured with high-strength, flame-retardant thermoplastic, and have been designed for easy cable insertion or withdrawal. The 2 RMS cable manager provides additional capacity for high-density patching applications. Siemon S110/S210 covers can be snapped on to provide color-coding and keep cables hidden.